*HURRY* Girls Essential Peacoat Jackets – ONLY $6! Head on over to Walmart where the Girls Essential Peacoat Jackets are on clearance for only $6! These are available in a few color options from sizes 12 Month to 4T! They are selling out quickly, so be sure to get them while you can! Shipping is free on orders over $50 or you can opt for free in store pick up. This Healthtex Baby Toddler Girl Essential Peacoat Jacket will be a great essential in your little girl’s wardrobe. This long sleeve collared jacket has a button down closure at the front, pleated skirt style with a bow detail and an empire waist as well. This jacket provides warmth and style. Your little one will want to wear this jacket every day this fall and winter. Choose form the assorted prints and colors to find an adorable jacket your little one will grow to love! *HOT* $50 Airbnb Gift Card – ONLY $35! If you love traveling, don’t miss this chance to save 30% of a $50 Airbnb Gift Card. Apply coupon code AIRBNB15 at checkout and pay just $35! Wireless Doorbell With 50 Chimes – ONLY $6.99 (Reg: $12) after code! Head on over to Amazon and score the Wireless Doorbell With 50 Chimes for only $6.99! This is regularly priced at $11.99 and you will save $5 when you enter the code R4YPXV3J at checkout bringing the total down to just $6.99! Unlike most doorbells that have just one boring dull chime, the Housmile doorbell offers you a total of 52 amazing chime tones, from the traditional “Ding Dong” to various well-known melodies, that you and your kids will definitely love! Note that you can also choose among 4 different volume levels the one that you best prefer! Little Tikes Tumble Train – ONLY $10.99 (Reg: $25)! Head on over to Amazon and score the Little Tikes Tumble Train in frustration free packaging for only $10.99! This is regularly priced at $24.99! Chase and catch the craziest, wildest, and wackiest toy in town for hours of fun! Just press the button to start the train. As the train moves along, the track will tumble around everywhere, inspiring kids to chase after it! The train will randomly reverse directions at times, causing track to roll in unpredictable directions that will capture your child’s attention! This is one toy that will be sure to get kids active! Product Features: Activate train by pressing the button to get it running around the track Track tumbles around everywhere Train will randomly reverse directions, causing track to roll in unpredictable directions that will capture child’s attention Encourages active play Includes lights and sound effects Ages: 3+ years. Head on over to Kohl’s and score The Big One Bath Towels for only $2.54 each! These are regularly $9.99, but are currently on sale for only $2.99! Plus you will save an additional 15% off when you enter code FIREWORKS at checkout! These are available in multiple colors and shipping is free on orders over $50, or you can opt for free in store pick up where available instead! Save an Additional 10% Off Select Toys! Woah! If you are an Amazon Prime member you can save an additional 10% off select toys through 12/31/16! These toys are already marked at great prices and the extra 10% will come off at checkout! *HOT* MAC Little MAC Cosmetics – ONLY $5.00 + FREE Shipping (Reg: $10)! MAC Little MAC Cosmetics – ONLY $5.00 + FREE Shipping (Reg: $10)! Head over to Macy’s and score this deal on MAC Little MAC Cosmetics for $5.00 + FREE Shipping (Reg: $10). Choose from Pigment, Zoom Lash Mascara or Lipglass. When it comes to travel, small is an absolute virtue. With Little MAC, a selection of your favourite products is available in travel-ready sizes. A pop of colour on the go is quick and easy with five new hues of mini Zoom Lash, an expanded Lipgloss lineup and Pigments in some of our best-selling shades. *RUN* BonTon Gift Card – ONLY $40 ($50 Value)! Run on over to Amazon and grab a $50 BonTon Gift Card for only $40! This is a lightning deal, so it is only available for a limited! 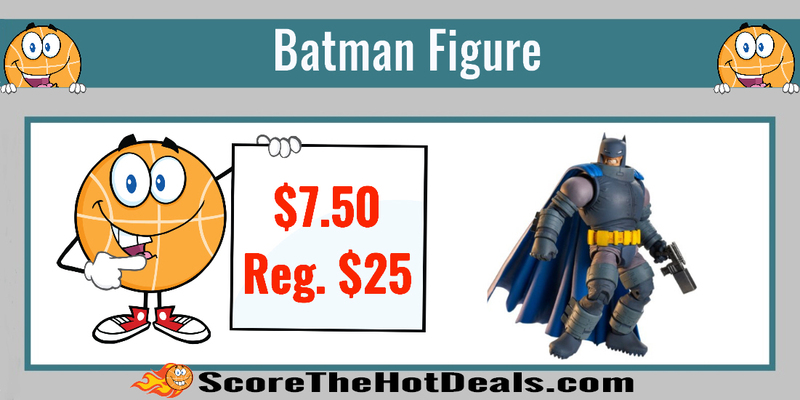 DC Comics Multiverse The Dark Knight Returns Armored Batman Figure – ONLY $7.50 (Reg. $25)! Batman Fans!! Head on over to Amazon and grab DC Comics Multiverse The Dark Knight Returns Armored Batman Figure for ONLY $7.50 (Reg. $24.99)! If you are an Amazon Prime members, you will get an additional 10% off, making it just $6.75 (free Amazon Prime 30-day trial here)!! Fans and collectors will love this highly detailed 6” Batman figure from the hit graphic novel, The Dark Knight Returns. The DC Comics Super Hero wears his high tech armored Batsuit with authentic sculpting, and has 18+ powerful points of articulation for epic battle and posing. He also includes a bonus piece to connect and build a New 52 Comic Book Doomsday figure when added to other figures’ pieces in the Pop Culture assortment! You can collect favorite DC Comics Super Heroes and Super-Villains from TV, features, games, comics and beyond and recreate all the thrilling action battles throughout time. Each sold separately, subject to availability. Colors and decorations may vary. Silicone Clip On Pouring Spout and Strainer – ONLY $6.16! Ready to save a step in the kitchen?! Head on over to Amazon and grab the Silicone Clip On Pouring Spout and Strainer for only $6.16! Drain pasta, get rid of pan grease, and pour cupcake batter with ease while using this pouring spout from the Silpoura Clip On line. Made from red silicone, it is durable and long lasting. It attaches to mixing and serving bowls, pots, pans, skillets, and double boilers for a mess-free, precision pouring and straining. The spout comes with its own detachable strainer that strains off grease and oil for environmentally friendly disposal and doubles as a spoon rest. It’s a true go to gadget that makes short work of everyday kitchen and cooking tasks. Best of all, it is dishwasher safe and will withstand cooking temperatures of up to 350 degrees Fahrenheit.